The ASCII Mission Stick is a peripheral for the Sega Dreamcast manufactured by ASCII. 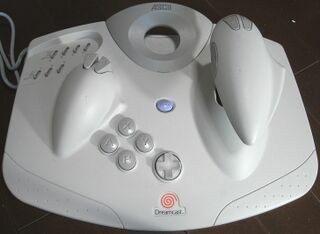 It was built with Dreamcast flight simulators in mind, specifically the six games in the Aero Dancing series (Aerowings in the west). Like most of ASCII's peripherals, the Mission Stick was only released in Japan. The analogue stick, which also functions as a Dreamcast Mouse.